META-Health Practitioner Mentoring - META-Health Academy. 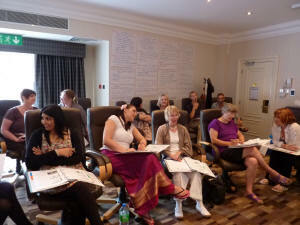 META-Health Practitioner Mentoring - META-Health Academy. Boost your confidence with META-Health Analysis, learn new approaches, develop your knowledge and skills. This is an opportunity for you to enhance your knowledge, understanding and skills in META-Health Analysis and META-Health Coaching and receive supervision from Robert Waghmare and Joanne Ross, the UK’s META-Health Senior Master Trainers. The META-Health Mentoring Day is open to those who have completed the META-Health Foundation (Introductory) Weekend or beyond. The Mentoring Day will give you valuable knowledge, understanding and skill if you're training as a META-Health Practitioner or Master Practitioner or if you've already qualified and keen to further your development. Robert and Joanne have formulated and continue to evolve a unique synthesis of philosophies, methodologies and techniques from META-Medicine, Health Coaching, Life Coaching, Systems research methods, cybernetics, psychotherapy, systemic therapy, NLP, EFT, Energy Psychology, META-Kinetics Advanced Kinesiology and The Human Design System. As such, they have developed unique and unparalleled approach to coaching and therapy. They are on the Advisory Board for the International META-Medicine Association, and are actively furthering the development of the field, with innovations such as META-Kinetics, the Emotional Pattern Elicitation Process and the forthcoming Fusion Approach. Robert and Joanne have been teaching META-Medicine and META-Health since 2007, and have shared META-Health principles with thousands of people through their talks, courses and articles. They ensure that participants gain maximum learning and experience, as well as developing a deeper understanding and of course, some transformation of their own! ‘Your training was great as always! You were very patient, very forthcoming with information and support. I really enjoy the family spirit working with you guys. Why Join Our META-Health Mentoring Day? This META-Health Mentoring day will give you the opportunity to gain deeper insights into META-Health, develop your analysis skills and practice with fellow students and META-Health Professionals. You will gain the opportunity to ask your most complex META-Health and mind-body health related questions, and begin a troubleshooting process to overcome any difficulties or barriers you may be experiencing with clients, your own practice, or within yourself. Each Mentoring Day provides opportunities for meeting and sharing with fellow therapists, health professionals, META-Health Practitioners, Master Practitioners, Coaches, Trainers and Master Trainers. What Will We Do On the META-Health Mentoring Day? The content of each of our META-Health Mentoring Days is based on participants' needs, desires and learning requests. What would help you to develop your use of META-Health most? Let us know what you really want to learn and have it included in future Mentoring Day programmes! You can book for one day, or book two or three days with our EFT and/or META-Kinetics Mentoring for a whole Mentoring Weekend. We offer special rates for previous students (those who have completed our EFT Level 1 and 2 or Level 3 courses, META-Health Foundation Weekend, META-Health Professional Training or META-Kinetics training).